How to watch Falling Skies: Season 5 (2015) on Netflix Austria! Sorry, Falling Skies: Season 5 is not available on Austrian Netflix, but you can unlock it right now in Austria and start watching! With a few simple steps you can change your Netflix region to a country like Argentina and start watching Argentine Netflix, which includes Falling Skies: Season 5. 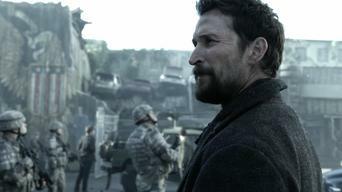 We'll keep checking Netflix Austria for Falling Skies: Season 5, and this page will be updated with any changes. 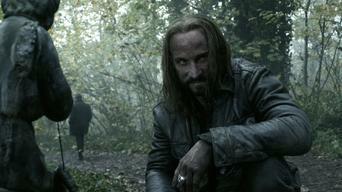 Falling Skies: Season 5 is not available in Austria BUT it can be unlocked and viewed! A professor uses his knowledge of military history to strike back against aliens who have devastated Earth, killed his wife and kidnapped his son. 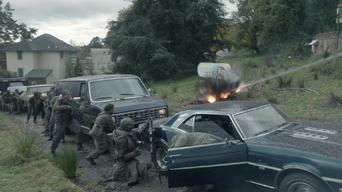 A history professor leads insurgents against alien invaders. To survive the present, he'll need lessons from the past. Season 1 of Falling Skies has 10 episodes. Because different Netflix countries have different availability for episodes, you'll need to check the episode listing below to see which are available in Austria. When an alien invasion leaves Earth devastated, the survivors battle against the occupiers. While scouting for supplies, Tom, Hal and their squad encounter a gang of pillagers determined to get their hands on weapons. Dr. Michael Harris joins the 2nd Mass and tries to figure out what happened to the teens who were abducted by aliens. Tom and his team try to find more motorcycles for the 2nd Mass, relying on Pope. They are successful -- until they come face-to-face with some teens. Hal devises a plan to rescue captured teens, but it might require putting someone at risk. Meanwhile, tragedy strikes. Lt. Terry Clayton of the 7th Mass reveals that the aliens plan to attack the 2nd Mass. Clayton plans to lead children to a safe haven. Hal is set to battle a sudden threat against the children of the 2nd Mass. Anne must jump into action when Sarah goes into labor. Tom isn't convinced that Weaver is well enough to be in command. Meanwhile, the 2nd Mass gets ready to fight off invaders. As the 2nd Mass prepares for vicious attacks, divisions within the ranks just might tear the group apart. 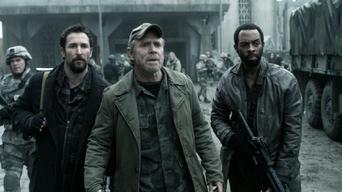 Weaver leads the fighters against the aliens while Tom remains behind to help protect the civilians as they evacuate. 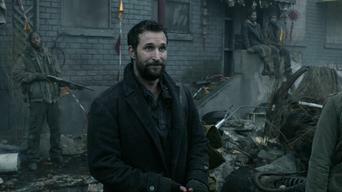 Season 2 of Falling Skies has 10 episodes. Because different Netflix countries have different availability for episodes, you'll need to check the episode listing below to see which are available in Austria. Season two starts three months after Tim Mason makes a compromise. Weaver commands the 2nd Mass. When Tom returns, his loyalty is questioned. Tom is still haunted by memories of his time with the aliens. Pope, responsible for interrogating Tom, creates suspicion of him in the group. The 2nd Mass moves into an airport hangar bay, but Anne worries about the group's health while berserkers hatch a plan to get rid of Tom. Ben and Hal try to help a young boy and end up with their motorcycles stolen. Their search for them results in finding something much larger. A familiar face returns to 2nd Mass with unknown intentions. And a rat is caught and brought to the camp. Hal finds bodies of abused children and some from his past. Weaver's health deteriorates as Tom discovers he may have withheld important information. 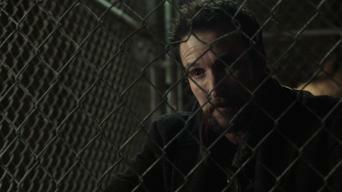 Ben is in danger from someone he thought he could trust. Tom takes a hostage. 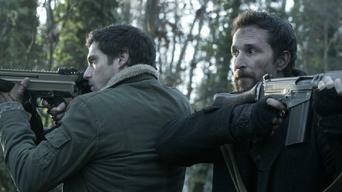 Weaver offers Matt a job and members of the 2nd Mass are captured. Some still mourn over the group's loss. Weaver learns more about Tector's background before the invasion. Matt bonds with a newly found abused girl. The 2nd Mass meets new faces. Tom encounters his former mentor. But who can he trust? Maggie realizes that Pope may not stay with the group. Many are surprised when Skitters close in on the rebels. 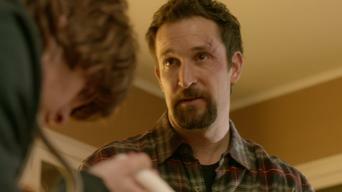 Tom gets news that can change his life, and the 2nd Mass faces its most dangerous threat. Season 3 of Falling Skies has 10 episodes. Because different Netflix countries have different availability for episodes, you'll need to check the episode listing below to see which are available in Austria. 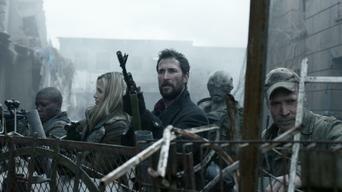 Falling Skies season three opens seven months after 2nd Mass arrives in Charleston. Tom is elected to political office; Hal wrestles with nightmares. While hostility escalates, Tom contacts a nuclear specialist, and asks him to come up with a plan that will strip the foreigners of power. The second anniversary of the invasion nears and Charleston's citizens prepare for a new offensive. A sniper attack causes questions and doubt. After the citizens of Charleston have driven back a new attack using new and advanced weapons, Tom is invited to meet with a powerful leader. When a mission goes badly, Tom and Pope have to trust each other. 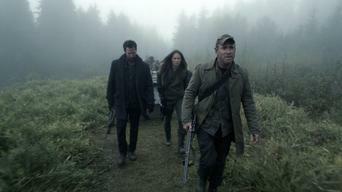 Weaver and his friends look for members of the 2nd Mass who have disappeared. Tom figures out that something -- or someone -- is controlling Hal. Lourdes experiments with a new, risky medical procedure. The Masons have continuous trouble when a family of outlaws shows up. Doubt increases concerning building of a massive alien weapon. Tom thinks it seems too good to be true. On the way back to Charleston he makes a series of discoveries, some surprising and others terrifying. Tom uncovers confidential intelligence about the heart of the alien operation. Charleston prepares for an offensive against Espheni. When the 2nd Mass destroys an important Espheni base and a merciless enemy, the Mason family is united with those that had disappeared. Season 4 of Falling Skies has 12 episodes. Because different Netflix countries have different availability for episodes, you'll need to check the episode listing below to see which are available in Austria. A fearsome new Espheni war machine attacks and scatters the 2nd Mass, forcing them to develop new strategies to survive. Tom must make an awful choice when he discovers details of the Espheni plan for humanity, and Lexi's loyalty comes into question. Led by Tom, the 2nd Mass hatches a plan to escape the Espheni ghetto, and Mira plans an escape of her own from the Espheni youth camp. The Volm offer the 2nd Mass safe haven after they escape the Espheni ghetto, and Anne makes a discovery when she reunites with Lexi. Tom gets Matt out of the Espheni youth camp but soon faces mysterious new foes, and Hal tries to lead the Volm and 2nd Mass to safety. As Lexi succumbs to an illness related to her hybrid DNA, the 2nd Mass splits into factions over whether she and her powers can be trusted. The 2nd Mass and the Volm face their most devastating battle yet when they join forces to combat a fresh Espheni attack. After a catastrophic battle, gravely wounded Maggie fights for her life, and Tom and Dingaan commandeer a crashed enemy Beamer ship. On his way to a Volm supply dump, Tom encounters Mira, who claims to have escaped from the Espheni -- but Tom suspects she's hiding something. Members of the 2nd Mass draw straws to decide who will pilot the salvaged Beamer ship to the moon to attack the Espheni power core. To prove her loyalty, Lexi joins Tom on his mission to the moon and must scramble to save both their lives when the ship malfunctions. An Overlord intercepts Tom and Lexi on their mission to destroy the Espheni power core, and the 2nd Mass faces a fresh Espheni attack. Season 5 of Falling Skies has 10 episodes. Because different Netflix countries have different availability for episodes, you'll need to check the episode listing below to see which are available in Austria. Tom and Lexi's successful mission to destroy the Espheni power core on the moon is soon followed by complications as Tom's Beamer drifts into space. A Skitter assault sends the 2nd Mass on a risky mission to replenish their food supply. The group also learns the Espheni have created a hybrid being. As Tom takes leadership of other militias around the world, the 2nd Mass searches for the source of the seemingly endless supply of enemy forces. Pope vows to avenge Sara's death and sets his sights on Tom Mason. Anne offers a solution for extending Cochise's life so he can stay with the group. As the 2nd Mass heads out of Chinatown toward what they anticipate will be their final battle with the Espheni, a deranged gunman kidnaps Weaver. An injured Tom takes refuge with a family that's distanced itself from the war. An Espheni device is found, and Hal and Isabella's romance blossoms. After arriving at a safe haven run by Weaver's old flame and colleague, the 2nd Mass begins concocting a plan for dealing the Espheni a fatal blow. After learning the startling truth about an old friend, Weaver is determined to protect the 2nd Mass. Tom leads the group in an escape attempt. A powerful new weapon could help conquer the Espheni. Ben risks his life to swipe enemy plans, Pope attacks Tom, and a surprise visitor shows up. The 2nd Mass, the Masons and their new allies wind up smack in the middle of an iconic American location as they gather for their final standoff.